The FL-1700 Series has been discontinued. Please see the FL-3000 and 3100 Series as a possible alternative or contact our Flow Engineering department. 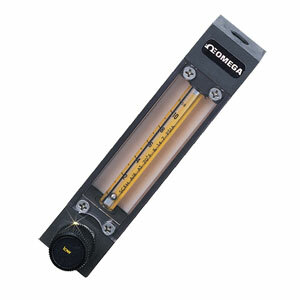 The OMEGA ® FL-1700 and FL-1800 glass tube rotameters are similar in design to the FL-1300 and FL-1400 series units, except that these units are designed for use with corrosive fluids. Fluid contact is limited to the glass tube and float, PVDF end fittings, FKM O-Rings and tube packing and the PTFE float stops. No stainless steel wetted parts are employed. These units are also available with an optional integral needle control valve (Note: the valve has 316 SS wetted parts).